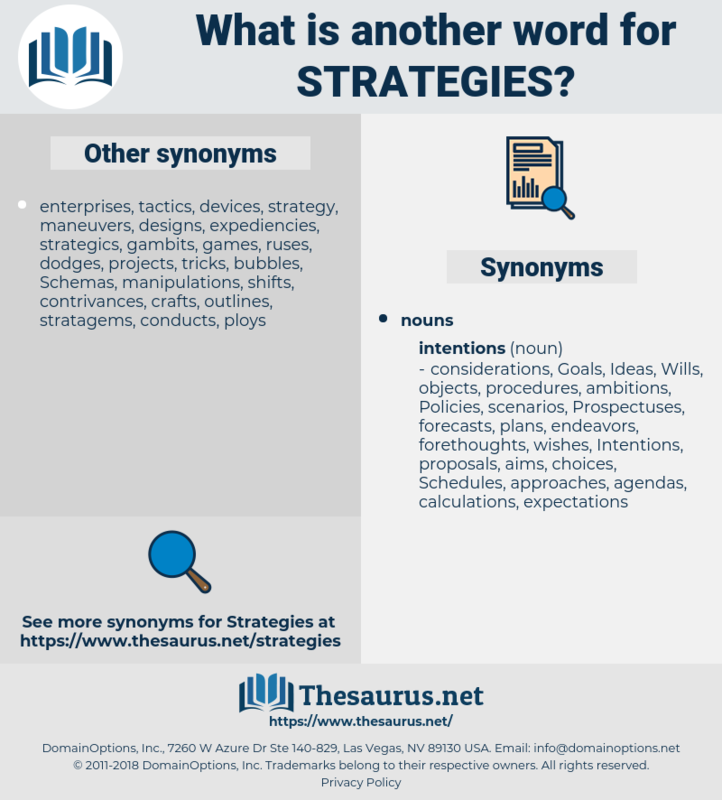 What is another word for strategies? principles, interregional, sector, Expenditures, savings, risk, long-term, research, saving, des, advancement, nairobi, BSS, senegal, prevent, september, advance, Them, association, Urs, provincial, PRSS, promotion, c., group, brunswick, june, lake, D, approaches, sstrategy, strategie. 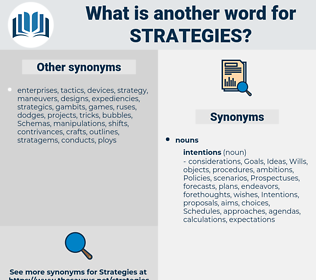 communications, methodologies, tactics, strategists, steps, partnerships, techniques, technologies, responsibilities, targets, perspectives, e-strategies, initiatives, agendas, terms, ways, assets, stakeholders, operations, arrangements, scenarios, matters, courses, investing, Efforts, systems, Measures, directives, patterns, countermeasures, means, steroids, Guidelines, Resources, aspects, concepts, directions, effects, elements, methods, innovations, proposals, interventions, alternatives, objectives, disasters, Suggestions, mechanisms, priorities, doctrines, Ideas, trends, Measurements, parts, framework, frameworks, procedures, practices, PROSPECTS, behaviours, actions, schemes, Possibilities, Analyses, Governments, Schemas, Capabilities, outcomes, processes, Risks, components, PRSPS, sectors, MDGS, Opportunities, interests, services, projects, issues, players, results, instruments, experiences, Pesticides, Areas, implications, modes, external, restoration, lessons, insights, repercussions, parameters, responses, findings, tools, boards, uses, politics, careers, solutions, options, devices, Activities, shares, Goals, fields, skills, modalities, Capacities, continuous, continues, pleas, develop, Parties, types, speakers, attempts, Axes, challenges, data, Droughts, item, IMPACTS, ies, Facilities, needs, groups, Ones, durable, hinges, Forms, citizens, levels, Countries, Communities, act, councils, 2005, principles, changes, LINEs, approaches. implementing, learning, Managing, reducing, monitoring, coping. prepared, proposed, identified, adopted, committed, developed, concerned, Discussed, based, funded, called.